About the club : Saitama club officially started in 1992, when it became independent from Tokyo club. We have 61 members now. Many of our members live in Saitama City, where most of the club activities are held. Some live in other cities of Saitama Pref., while others live in the wider Tokyo Metropolitan Area. The club members are eager to meet friends both old and new, and learn about their cultures. About the region : Saitama is located next to Tokyo, capital of　Japan. Saitama has good access to Tokyo, a rich traditional culture and a quiet environment. The population of Saitama City is 1.2 million, and the population of Saitama Prefecture is about 7 million. The abundant nature and rich tradition of Saitama have helped to develop numerous special products. OGAWA PAPER : The charm of Japanese paper lies in its deep coloring and pleasant touch. The technique of hand-making Ogawa Paper has been designated an important intangible cultural treasure. 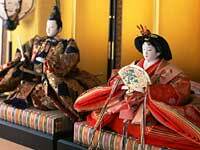 HINA DOLLS : The Hina Festival is a traditional festival for girls on March 3rd. It is celebrated by displaying elaborate dolls with beautifully colored costumes that represent elegant court life of historical Japan. Saitama produces these beautiful dolls. BONSAI VILLAGE : "Bonsai Village" in Omiya is world famous. Visiting the Bonsai gardens brings peace and contentment to people throughout the year. SAYAMA TEA : Saitama is one of Japan's leading tea-producing areas. The quality of tea is judged by its color, aroma and flavor. Saitama tea has richness in all these aspects, but is especially well known for its superb flavor. About the exchange : Since our club was established in 1992, we have enjoyed many outbound and inbound exchanges. We prefer to host in spring or fall as those are our beautiful seasons in Saitama. Ambassadors can use a direct/non-stop bus from the airport to get to Saitama. During each exchange we usually have a welcome party and farewell party. Ambassadors will have an opportunity to see the sights of Tokyo, and experience Japanese culture like flower arrangement, tea ceremony, traditional Japanese music and trying on kimono. We often arrange a bus trip to scenic spots like Nikko, too.